The above artwork was recently auctioned at ebay and was eventually sold for a winning bid of 90 British pounds. 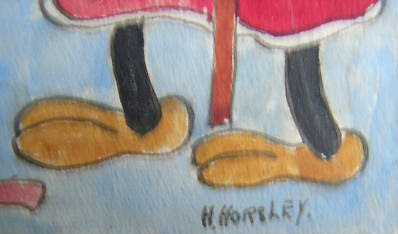 The overall design obviously recalls the pre-war covers of Britain's Mickey Mouse Weekly, which are known to be the work of British artist Wilfred Haughton, but not only is the artwork signed by one "H.Horsley", the actual depiction of the figures is awkwardly 'distorted', which, in my tentative opinion, makes it unlikely that it was intended for MMW. The ebay seller speculated it might have been a sketch for Haughton to finish up, but I suspect this might have been a private re-working of MMW covers for unknown motives. 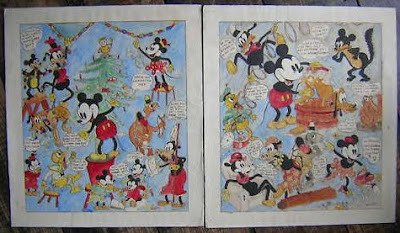 I personally think it's a piece of folk art - someone saw a Mickey Mouse Weekly with the same or similar cover and decided to do one for themselves...but that's just my opinion.